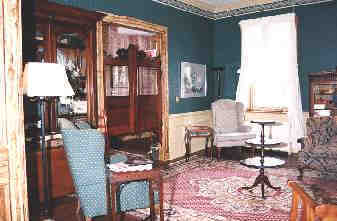 Upon arrival, guests are always greeted in the front hall and given a welcoming tour of the first floor parlors. 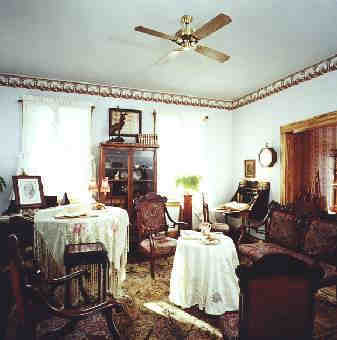 Furnished with Victorian antiques, the music parlor features a signing quilt, pump organ and baby grand piano. Before departing, guests are invited to sign the quilt in progress. As a permanent tribute to our visitors, the first quilt is on display in the second floor hall and past quilts are used in the guestrooms. The pump organ still works for those with plenty of stamina. If piano is more your style, there is plenty of sheet music available. For much of the building's life the Saloon Room did indeed function as a saloon; a place where local folk could gather, have a friendly libation and catch up on the news. Our guests are welcome to join us for a social hour from 6:00 to 7:00 p.m. each evening. The first pool hall permit west of the Mississippi River was issued to this hotel in 1812. Today guests are invited to use our "Southern Hotel" pool table, which was made for the Southern Hotel in St. Louis in 1875. To commemorate their twenty-fifty anniversary, A.E. 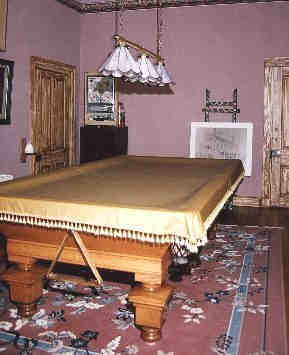 Schmidt Company handcrafted twelve special edition pool tables for the Southern Hotel in St. Louis. The hotel in St. Louis was named for and after our Southern Hotel in Ste. Genevieve. That Southern in St. Louis burned down in 1877. Only one of the twelve pool tables survived the fire. We have that table here for your pleasure and hope you will enjoy a good game and some quiet time. Our table is in championship condition and is considered a classic nine-foot standard.